Our new lightweight street frame that allows up to 64mm wheels flat rockered. The MEGA has a more traditional height, offering a low center of gravity and familiar balance on topsides and h-block grinds. 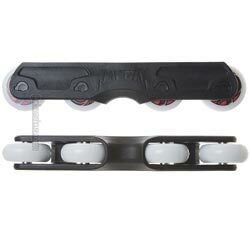 The h-block is designed to wrap around the inner wheels to help safeguard skaters from the dreaded wheel bite. Wheel spacing allows for full access to UFS bolts making frame change/rotation a breeze. UFS mounting points have been beefed up to 9mm thick to increase stiffness and prevent any unwanted fracturing. Streamlined sidewalls, aluminum spacers, and our 8mm sickle axles complete what shapes up to be everybody’s favorite frame for grinding ledges and carving bowls. These frames are amazing. Same classic GC plastic rolling 65 wheels 8 down is a dream come true. I have felt for a long time that 65 was the perfect wheel size for blading and GC made the perfect frame for it. The wheel bite protection is on point. My back royals lock in and just feel solid even on square ledges. I think I have found my favorite frame. I have skated everything under the rainbow from the original FTL's and FTL 2's and FTL 3's to OG CO's to F1's (Original and XS and both Freestyle and Anti) and bunches of others and I can say these are by far my favorite frames I have skated. I've never had tried this type of frame before and I have to recognize that it was difficult to me make my first tricks with a flat setup. After three sessions I started to feel better taking advantage of the speed. Groove it's great and becomes better through the time, wheels are decent but 8 mm axles aren't good, you have to be careful with your keys. I recommend this product with an antirockets package (just in case if you like street blading).